Move over William Sonoma! Get out of my way, Sur Le Table! 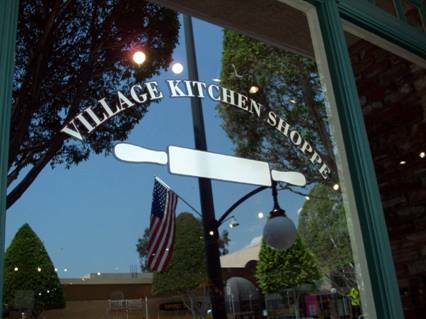 The Village Kitchen Shoppe may not be as mighty or as well known as either specialty retailer of quality kitchen ware, but the 2,500-square-foot neighborhood store in the heart of Glendora’s gumdrop-shaped, ficus tree-lined shopping district knows its way around the kitchen, thank you very much. 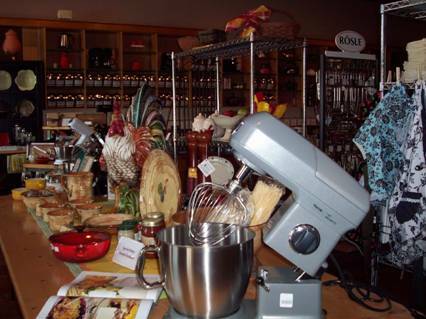 Since 1983, the Village Kitchen Shoppe has been providing Southlanders with the finest kitchen cookware, specialty foods, bulk coffees and teas, local wines, gift items, gift baskets, cookbooks and cooking classes – and all with unbeatable service. “We really try to keep our prices equal or under our competitors, knowing they are a lot better known than we are,” said co-owner Carol Harrell, who makes her home in La Verne. “Our customers have been very loyal to us, so want to make sure they always get the best deal they can get. “We don’t carry any Wal Mart items, so Wal Mart coupons not accepted here,” Harrell, said laughing. Although Harrell and her partner Dede Peronto have owned the store a little less than three years, they are having way more fun than either of them expected. So it’s pretty much the high holidays every day of the year at the Village Kitchen Shop. Meanwhile, the southern wall of the 1902 building boasts dozens of specialty coffees (flavored and unflavored) and teas to satisfy the most discriminating palate. Members of the VKS Coffee and Tea Club also receive special discounts to help soothe the financial sting of their caffeinated or decaffeinated addictions. The north wall is a gallery of gleaming gadgets, some of which in your serendipitous journey through the shop you’re likely to see for the first time. For instance, think of all those great pains you’ve suffered over the years cutting up mangos, when all you needed was a mango slicer. Making their way through the store, shoppers will find Lazy Susans fashioned from wine barrels, which make cool wedding or housewarming gifts, to fully stocked picnic baskets, which you can take to the Hollywood Bowl or your next concert in the park. “They’re really popular right now,” Harrell added, tapping the little cheese board that came with one picnic basket. Away from the cookie cutters, spring-form pans, bouquets of spatulas, and this indestructible-looking toaster oven (“It’s a Breville, it’s the best,” Harrell advised), the real fun takes place in the back of the shop where the weekly Wednesday and Saturday cooking classes are held by top local chefs, including co-owner Peronto. The “Dinner Party” features pear and arugula bundles with prosciutto; Tuscan white bean soup; seared lamb chops with minted couscous and pomegranate glazed carrots; and for dessert, dark chocolate pots de crème with berries and whipped cream. “You’re going to learn every trick in the book,” Harrell said. After watching the demonstration and presentation, cooking class attendees get to eat all the portions and take home the recipes. Classes accommodate a minimum of eight people and a maximum of about 20 people. Classes normally run $50, but the Village Kitchen Shoppe is running a summer special in which you can book all the August cooking classes you want for $30 each. Just as popular as the Village Kitchen Shoppe’s cooking classes are the store’s gourmet take-out items. Current menu choices include beef bourguignon, chicken Marbella, macaroni and cheese, Mexican (vegetarian) quiche and classic quiche Lorraine. All the take-out cuisine is cooked in the Village Kitchen Shoppe kitchen. “The classic quiche is to die for,” Harrell adds enthusiastically. Just as it takes the perfect mix of ingredients to create an extraordinary gourmet meal, it takes the perfect blend of personalities to build a successful business. About two decades, Harrell owned a salon in the Old Adobe Village shopping center that once stood at the southeast corner of Foothill and Wheeler in La Verne. Peronto was one of her favorite clients and they remained friends even after the ill-conceived shopping center was demolished. Harrell moved into the escrow business and Peronto, after a career in banking, ran a successful Claremont-based catering business for nearly a decade. About three years ago over lunch, the friends, who had heard from Harrell’s sister Barbara that the Village Kitchen Shoppe was up for sale, discussed whether they should go into business together and buy the store. Their choice to go ahead wasn’t any earth-shaking or life-altering decision. It just came naturally, like passing around salt and pepper shakers or a basket of breadsticks. “We asked, ‘Do you want to do this?’ and we did,” Harrell explained. 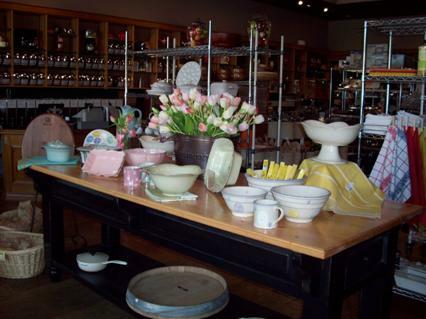 The couple bought the store’s merchandise, fixtures and longstanding goodwill. Through no fault of their own or the sellers’ – some things just fall through the cracks — they also bought a few headaches. They learned they had to replace the 1902 building’s fire alarm system. They also had to install a new point-of-sale and inventory system to move the shop into the 21st century. Yet their season in the fall of 2007 was a good one, and they’ve been adding new customers, new merchandise and vendors like Le Creuset and All-Clad (cookware), Wusthof (cutlery) and Marston (gourmet dressings), to name a few, ever since. “When we bought this place, we said we would never leave it,” Harrell said. “That’s our dream, to stay here forever. Disneyland may be the original “happiest place on earth,” but Harrell and Peronto are too much in the moment right now to care about such minutiae. Sometimes, too many details, like too much salt, only spoil the broth anyway. 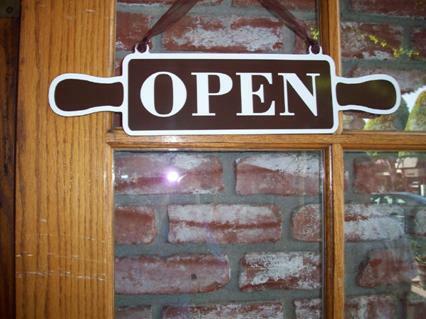 You can find the Village Kitchen Shoppe at 147 N. Glendora Ave. or at www.villagekitchenshoppe.com. The phone number is (626) 914-7897. 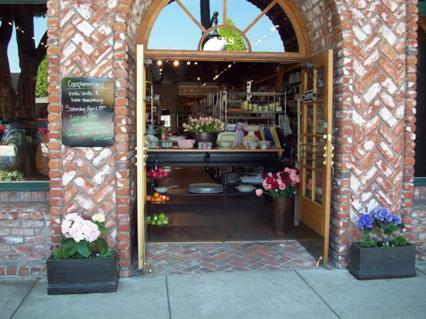 If you love the Village Kitchen Shoppe in Glendora, you’ll also love Outdoor Elegance in La Verne, home of the Big Green Egg. For more information, click on the Outdoor Elegance ad on our LaVerneOnline home page. Bon Appétit!